Dr. Ray received her Bachelor of Science degree in biology and chemistry from Judson College in 2007. She received her Doctor of Optometry degree from the University of Alabama at Birmingham School of Optometry in 2011. She completed residency training in Pediatric Optometry in 2012. During this time, she provided routine eye care for pediatric and adult patients, vision therapy services, and eye care for special needs children and adults. 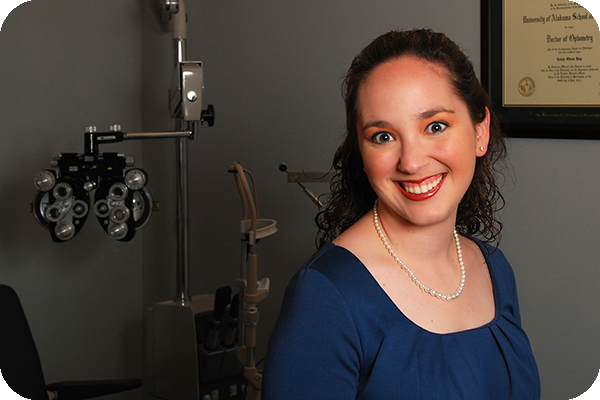 Dr. Ray was the 2011 recipient of the Alabama Optometric Association Leadership Award and was named the 2011 Department of Optometry Outstanding Student. Additionally, she is a member of Beta Sigma Kappa International Optometric Honor Society, Gold Key International Optometric Honor Society, the American Optometric Association, and the Alabama Optometric Association. Dr. Ray married her husband, Steven, in 2007. They have two children, Carter and Colton.